US stocks closed lower on Friday as investors digested a batch of key economic data. The Dow Jones Industrial Average decreased 180.43 points, or 0.68 per cent, to 26,447.05. The S&P 500 decreased 16.04 points, or 0.55 per cent, to 2,885.57, Xinhua news agency reported. 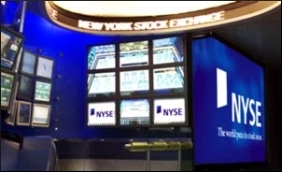 The Nasdaq Composite Index fell 91.06 points, or 1.16 per cent, to 7,788.45. The unemployment rate declined to 3.7 per cent in September, and total nonfarm payroll employment increased by 134,000, the US Department of Labor said on Friday. However, the figure was well below the expected gain of 185,000. Job gains occurred in professional and business services, in health care, and in transportation and warehousing, said the department. In September, average hourly earnings for all employees on private nonfarm payrolls rose by 8 cents to $27.24. Over the year, average hourly earnings increased by 73 cents, or 2.8 per cent. Meanwhile, investors continued to fret over the rise in bond yields. The 10-year note yield rose to 3.23 per cent and hit a fresh 2011 high on Friday. The bond rates surge started on Wednesday, boosted by strong economic data. Meanwhile, recent comments from top Federal Reserve officials also stoked yields higher. Fed Chair Jerome Powell on Wednesday said that the US central bank had a long way to go before interest rates hit neutral, indicating that more hikes could be on the horizon. Strong data and commentary from Fed officials can be bullish for equities, but that comes with the side effect of having concerns on more inflation and interest-rate increases, which in turn is a negative for equities, experts said.